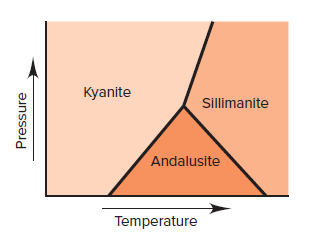 Solution: Kyanite, sillimanite, and andalusite all have the formula Al 2SiO5. Each is stable under different conditions (see the graph below). At the point where the three phases intersect:(c) Which mineral, if any, has the highest entropy? (c) Which mineral, if any, has the highest entropy?